You can always scan it on a printer, and then transfer that file to your computer, upload it online, and post it here. You could also take a photo of it, but you would lose quality. 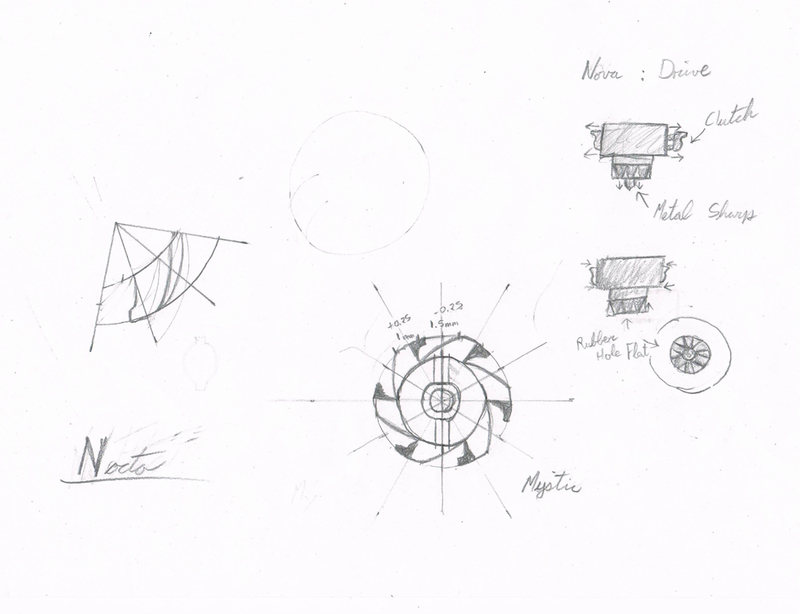 I have designed all the parts, and I am going to make a top view and a side view. Littlestar is the smallest Clear Wheel in existence, however its 4D Clear Wheel Material is not Metal Shavings, but designed with 100% diamond from Outer Space. This makes it the heaviest Clear Wheel. Even though it's small size would seemingly make it a good choice for exposing a Metal Wheel's slopes or shape, it is extremely offbalanced for any metal wheel to use it properly. 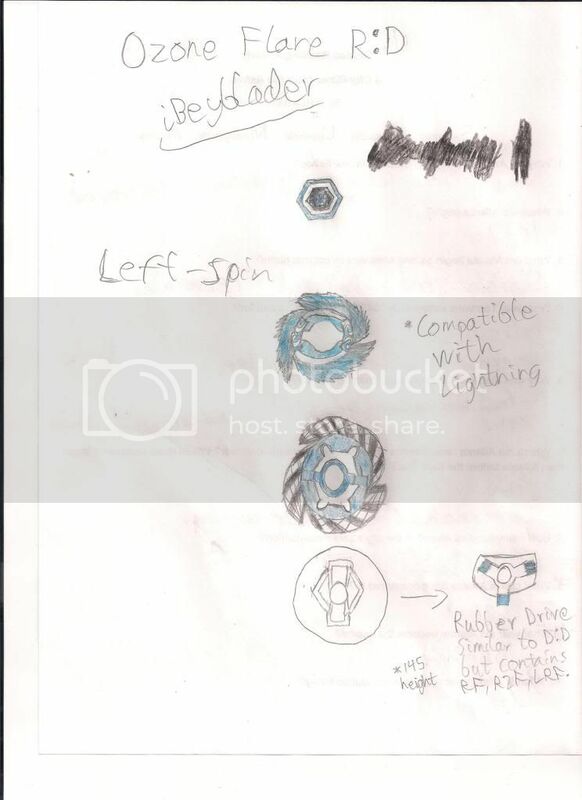 The Twinkle 4D Metal Wheel consists of a PC Frame(Which is a gear that represented the Space Ship that found this Beyblade and brought it back to Earth), a Metal Frame(which is seemingly like a diamond in the sky, due to the diamond shapes on each of the wings), and a Core, similar to Big Bang Pegasis F . Like the Big Bang Metal Wheel, there are 4 modes, Galactic Smash, RocketShip Upper, Forceful Meteorite, and BigBadSpaceEngineer Attack. The PC Frame of Twinkle can be flipped upside down, similar to the PC Frame of Scythe Kronos. 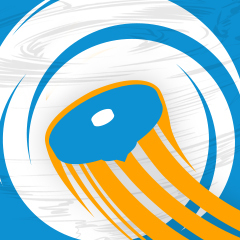 As with Scythe, one mode is Free Spinning and one mode is not. As with the Core of Big Bang, Twinkle's Core can be rotated in two different positions. Each of these 4 modes perform poorly in their designated aspect, due to the lightweight and high recoil tendencies of Twinkle. Although outclassed, Twinkle's best mode is Galactic Smash. When Paired with a Metal Face, an 85 Track, and R2F, we can create the fastest motion possible with Twinkle, maximizing it's Smash Attack. This 4D Bottom is truly out of this World(As in, Space). The ability that S has to outspin opponents at the end of a match is extremely beneficial to Left Spin Attack Wheels, due to their ability to steal and equalize spin. 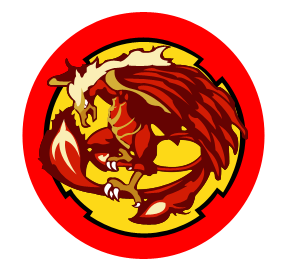 As such, Meteo L Drago, L Drago Destroy, Lightning L drago, Gravity Perseus, and VariAres all benefit from S .
Through ancient history, we've heard of the origins of a Beyblade not found on Earth. We've heard this mainly through nursury rhymes, but also through Scientific Space Engineering. Now that this ancient Beyblade has been found, its secrets are only just beginning to reveal them selves. In the hands of the correct blader, Twinkle Littlestar S can stand up against several top bladers from other planets. There are better part alternatives, but S makeup for the absence of good parts. I'm a pretty open dude, so if ya wanna talk, or chill, send me a PM. I'll answer about any question about me haha. That took the most time. Although drawing was the hardest part. I went through several drafts of just the Metal Frame. WOW, SSJ, that's amazing. That article... It should be on Beywiki. Wait so, I would lose points for Creativity if I did this for a constellation, Kai-V clearly mentioned we could with no mention of losing anything. I'm not going to answer that, but IMO you would. Needs to be something original, not like everything else! Than what? I draw a star? Or a planet. Isn't there supposed to be a bit beast? Like Bull is Bull. What if it was a constellation so as to fit in with most the other Beys in the series, but also had other space related parts? That'd make it more realistic, to be honest. It'd make it seem kinda like it actually exists (if the other parts are realistic)! Now before any body laughs at my handwritng or my colouring,I just want you to know that I do not have a steady hand and I was using fat oil pastels because they were the only things I had for the moment,I let my imagination run wild,It may look a little to overpowered,but to balance it out,it has horrible stamina. Flare (Face) Depicts a sun, radiating energy. 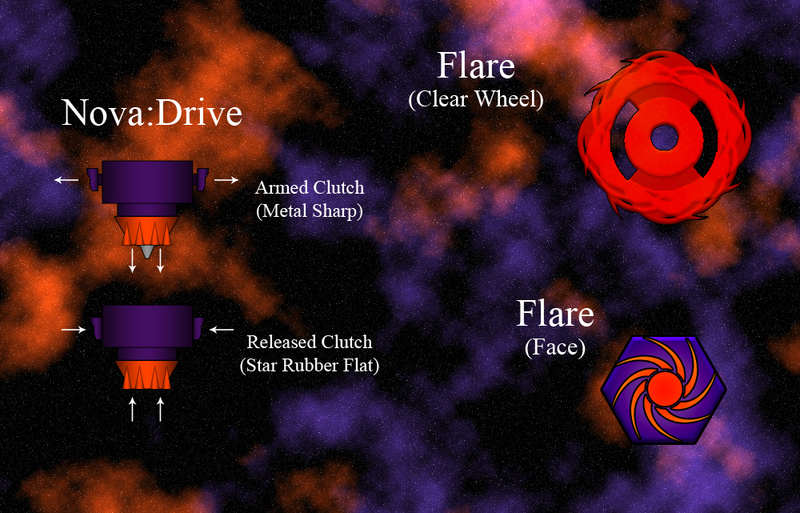 Flare (CW) represents the uncontrolled power and energy emitted from solar flares. Mystic Metal Core is a rather light metal wheel in the 4D line-up. It features 6 spiked protrusions going in a clockwise direction. 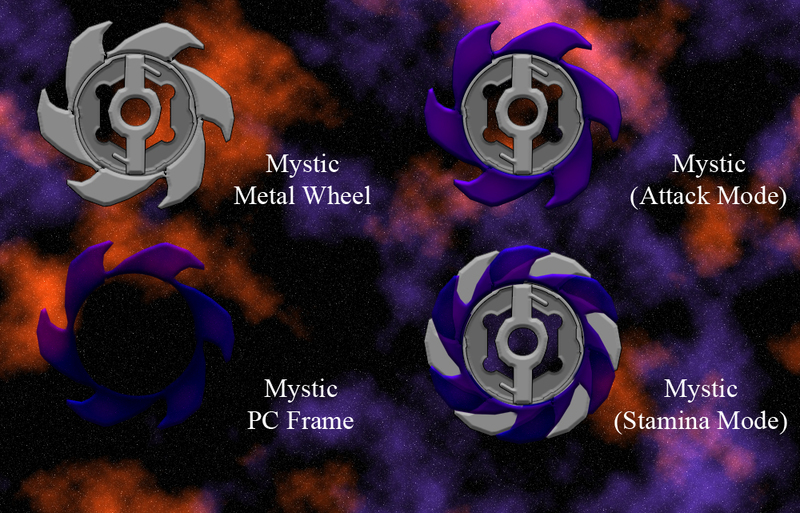 The Mystic PC frame is a hollow, plastic version of the Mystic Metal Core making for a unique mode change. 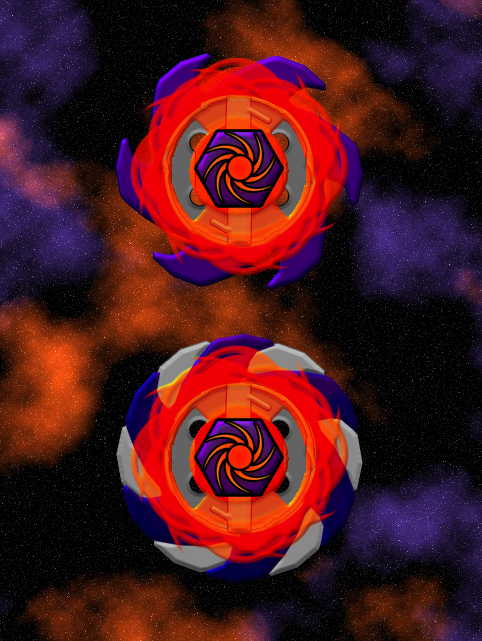 In Attack Mode, it takes the shape of a galaxy and covers perfectly the six protrusions of the metal core, allowing the metal core to fully utilize its spike attack properties but also to suffer from its large recoil. As such, this mode is best utilized at the start of the battle where its chance to KO the opposing beyblade is at its highest. In Stamina Mode, It takes the shape of a wormhole and turns the metal wheel into a perfect disc alternating between plastic and metal. This mode suffers from almost no recoil and makes for one of the best choices for a stamina wheel, easily out-spinning most Defense customs. However, its light weight diminish severely its defensive abilities and has proven ineffective against many Attack customs. This bottom takes elements from parts such as Right/Left Rubber flat, Final Drive and the Engine Gear series clutch bases. It seeks to emulate the life of planet, while also fixing certain issues from the Final Drive bottom. Arming the clutch reveals and locks the Metal Sharp tip into place. The stamina of such a bottom represents the long life of a sun. However, due to the nature of sharp tips in general and the height of the bottom, it may suffer extreme balance issues if the clutch is not released. When making contact with the opposing blade, the vibrations caused by the shock may release the clutch and thus, release the Nova:Drive. When this happens, the metal sharp tip retracts leaving place to the star rubber flat. The surface covered by this bottom is much larger than any other rubber flat variants, increasing its traction and attacking abilities but largely decreasing its stamina, much like a Nova exploding; it releases a large burst of energy but dies shortly after. This beyblade is a mixed lot. Its gimmicks are interesting, but are rather hit or miss in terms of Performance. However, Mystic in Stamina Mode performs exceptionally well in Stamina customs. Every Bladers should own at least one of this beyblade. I don't know how thats the only problem,I already scanned them on to the computer. Nocto, sweet mother of Jesus, that's awesome. But one thing. I posted my "entry" at the first post, which can be found at the top of the first page. As I mention my scanner isn't very good, i couldn't figure out how to enlarge the images. I might be entering. Yeah. (Oct. 18, 2011 6:16 AM)sum 472 Wrote: Dude, here in Australia normal starters are like 15$ and boosters for about 8$. (Oct. 20, 2011 4:15 PM)Uwik Wrote: Everytime I read "Shabalabadoo", my brain processes it as "Scoobydoobeedoo". This is a true fact btw. lol I think everyone does. Th!nk has shortened his name to Scooby Snacks. Kai-V Wrote: You are a rock. No, they couldn't. Stopping production on other items does not make the production of other new items cost less. Perhaps their business school graduates and engineers should bow to your superior knowledge anyway, though. It's not like they have degrees and jobs for a reason, or anything. (Oct. 29, 2011 9:06 PM)Chups Wrote: I've been seeing a lot of deception at the moment in Melbourne. how exactly is it stuck? (Nov. 06, 2011 3:45 PM)Dan Wrote: You only weak launch against opposite spin beys, what the hell? That's what I thought, good to hear I'm not going senile just yet. This user was warned for this post. This is real-life, get back from your mind's dream world where you think you are Link. Unless you have a three-dimensional screen with appropriate glasses on, it is not that scary. Then why did I pee a little? Hazel Wrote: I have a CS that started out angrier than a bear at a Chicago Bears game. Hazel Wrote: A Semi-Aggro CS can be launched and act like it's best friends with Sonic the Hedgehog until it hits something, at which point it will just stop cold and move into the center. Hazel Wrote: -Calm: Plastic extends beyond rubber, this guy is chill as heck and doesn't give a hoot. -REALLY MAD ABOUT EVERYTHING: RF. (Dec. 29, 2011 12:31 PM)Z.E.R.O Wrote: Is Kei ever actually to be afraid of? Be fortunate you don't live here, under that meek and gentle persona lies a horrible monster. Very horrible. I cannot even describe it, no human could. Imagine the fiery pits of Hell Kerbecs' special move, LDrago's menacing power and then that thing Haku (Inuyasha) turns into. Nothing can douse the anger and raw power which at one point, Kei's dwindling willpower will be forced to unleashed. I expect all of Canada to be engulfed in EMP when Kei's true form is finally released. That is the day the world cannot save itself. That day. The monster shall be awakened and mankind is most definitely doomed. No octopus or even a Kai-V would stop him. Don't you ever talk about it again. My PSN is minhal823. Add me if you'd like, just add your WBO username in the friend request so that I know it's you. Otherwise, I'll decline. I play Black Ops 2, Black Ops, MW3, and MW2. Wow, everyones putting their entries in so quick! However, I'm gonna take my time, heh. I've been waiting for a desigh a bey contest for so long! I already desighed a bey ever since I saw the first contest, but sadly it dosn't fit with the "space theme". All credit goes to SDamonCronous for this awesome sig! Please click it! It needs your help to grow! I wish i could enter, but I'm way to busy making videos. Awesome job, especially you Nocto, but I'm sure a lot of people will make great designs and articles as well! Who left that out ? I will try my best to enter! Actually, I want to enter but I am not sure... Still, I want to participate! G145 stands for Galaxy 145. It is an irregular shape track, just like an irregular galaxy. I've always expected an asymmetrical track by TT, but they never made one... So, I'll make it here! BH or Black Hole, is just another 'Hole series' tip, having a gimmick of opening and closing with the help of centrifugal force. It is a Ball tip, which retracts in a unique manner to form a hole tip. You may say Black Hole also means Ball Hole. I'll give the advantages/disadvantages as soon as I am done with the designs!